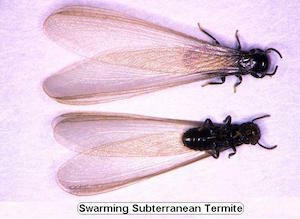 There are 2 main types of termites in Washington State – the subterranean termite and the dampwood termite. 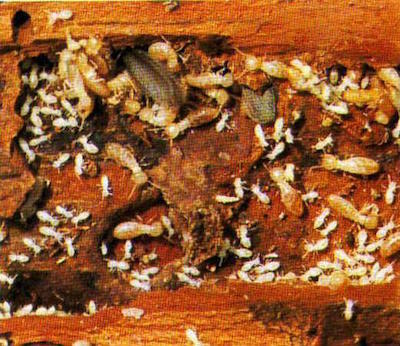 Termites feed on wood or wood products. Most termites need a moist environment (the soil or wet wood). If the termite colony is allowed to grow, they can produce great structural damage. Detecting termites can be pretty hard, but there are some signs that can give them away. There’s a reason why we call ourselves Northwest Termite and Pest Control! For post construction treatment, we offer both traditional liquid and the bait/monitoring system. When using liquid treatment only, we treat the foundation of the home, all slabs touching the home and all porches. However, we also offer the combination of both methods together, the liquid and the baiting system. Using both will help decrease your chances of having a termite problem in the future. The bait/monitoring system determines if the termites are present near the home. The termites feed on the bait/monitoring system and spread the bait with the other colony members. The traditional liquid is used to create a barrier around the home which will add a secondary area of protection. Finally, the other option is the baiting system only. We install monitors around the home and check them on a quarterly service refilling them as needed. For new construction treatments, we primarily use liquid. Using liquid allows us to put a protection barrier under the structure before it is actually built. After the structure is built, we return to apply a barrier around the finished structure. This is done after the structure has completely been finished being built and landscaped. Existing Subterranean Termite infestations usually requires complete treatment of the soil under and around the entire structure How ever some times a spot or localized treatment will Elimate the termites. Because of their wood-eating habits, termites sometimes do great damage to buildings and other wooden structures. Their habit of remaining concealed often results in their presence being undetected until the timbers are severely damaged and exhibit surface changes. Once termites have entered a building they do not limit themselves just to wood, also damaging paper, cloth, carpets, and other cellulosic materials. Often, other soft materials are damaged and may be used for construction. Particles taken from soft plastics, plaster, rubber and sealants such as silicon rubber and acrylics are often employed in construction. Termites usually avoid exposure to unfavourable environmental conditions. They tend to remain hidden in tunnels in earth and wood. Where they need to cross an impervious or unfavourable substrate, they cover their tracks with tubing made of faeces, plant matter, and soil. Sometimes these shelter tubes will extend for many metres, such as up the outside of a tree reaching from the soil to dead branches. Most termite barrier systems used for buildings aim to prevent concealed termite access, thus forcing them out into the open where they must form clearly visible shelter tubes to gain entry.